Thanks to your feedback, Swimia has grow to be in just many months one the most necessary web sites of swimming pools. 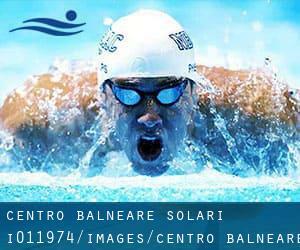 Here you have all the info we know about Centro Balneare Solari, in Milan. Do you know the opening hours? Are they providing any course? What's the cost for a single swim? Don't neglect you can also promote this pool so Centro Balneare Solari will appear the first of Milan, or even the very first of your country, contact us to know even more. Swimmers like you reported 25 meters x 10 meters, 5 lanes, 1.2 meters - 1.9 meters depth, 1.2 meters - 1.9 meters depth, Indoors. Unfortunately we do not have the e-mail address of this Swimming Pool, but we can provide you with the phone number. If you believe that any of the information is incorrect, please get in touch with us. Support us be better day-by-day. Updated on 2019 Via Tagliamento, 19 , Milan , ITALY (Postal Code: 20139). Swimmers like you reported 25 meters x 10 meters, 1.2 meters - 2 meters depth, 1.2 meters - 2 meters depth, Indoors. Unfortunately we do not have the email address of this Pool, but we can give you the phone number. Updated on 2019 Via Graf, 8 , 8th Zone , Milan , ITALY (Postal Code: 20157). Among all of the activities provided by the center, when you are interested in swimming you will appreciate 25 meters, 5 lanes, Indoors. Just in case you want to contact this Swimming Pool before dropping by, we only know the phone number. Updated on 2019 Via Assietta, 19 , Milan , ITALY (Postal Code: 20161). Swimmers like you reported 25 meters x 12.5 meters, Indoor/Outdoor. Phone number and email address are number for this Swimming Pool. Updated on 2019 Parco Idroscalo , Milan , ITALY (Postal Code: Unknown). Among all the activities supplied by the center, if you are interested in swimming you might appreciate 25 meters, 7 lanes, Indoor/Outdoor. If it is advisable to make contact with this Swimming Pool, email address and phone number are both number. Updated on 2019 Via Iseo, 10 , 9th Zone , Milan , ITALY (Postal Code: 20161). Swimmers like you reported 25 meters, 6 lanes, Indoors. Unfortunately we do not have the email address of this Swimming Pool, but we can give you the phone number. Updated on 2019 Via Lamennais, 20 , 7th Zone , Milan , ITALY (Postal Code: 20153). Among all the activities supplied by the center, in case you are interested in swimming you will enjoy 25 meters x 15 meters, Indoors. Just in case you would like to contact this Swimming Pool before dropping by, we only know the phone number. Updated on 2019 Via Sant´Abbondio, 12 , 5th Zone , Milan , ITALY (Postal Code: 20142). This sports center offers 25 meters x 12.5 meters, 5 lanes, Indoors. For this Pool, only phone number is number here. Updated on 2019 Via Lampugnano, 76 , 8th Zone , Milan , ITALY (Postal Code: 20151). Among all the activities provided by the center, if you are enthusiastic about swimming you will enjoy 25 meters x 12.5 meters, 5 lanes, 1.1 meters - 1.4 meters depth, 1.1 meters - 1.4 meters depth, Indoors. Just in case you want to contact this Pool before dropping by, we only know the phone number. Updated on 2019 Via Rossetti, 4 , Milan , ITALY (Postal Code: 20145). Among all the activities offered by the center, for anybody who is interested in swimming you can delight in 25 meters, 5 lanes, Indoors. If you need to make contact with this Swimming Pool, email address and phone number are both number. Updated on 2019 Piazza della Repubblica 1a , Milan , ITALY (Postal Code: 20121). This sports center provides 19 meters, Indoors. Contact information for this Swimming Pool such as phone number and email address are number. Updated on 2019 via Cagliero,14 , Milan , ITALY (Postal Code: 20125). This sports center delivers 22 meters, Indoors. For this Swimming Pool, only phone number is number here. Updated on 2019 Via Gioacchino Murat 39 , 9th Zone , Milan , ITALY (Postal Code: 20159). Swimmers like you reported 25 meters x 12.5 meters, 5 lanes, Indoors. Unfortunately we do not have the email address of this Swimming Pool, but we can give you the phone number. Updated on 2019 Via A. Corelli 136 , 3rd Zone , Milan , ITALY (Postal Code: 20134). Few days ago a regular user of this center told us they offer 25 meters x 12 meters, 5 lanes, Indoors. Furthermore, they keep in good conditions Olympic size x 20 meters, 8 lanes, Indoor/Outdoor. For this Swimming Pool, only phone number is number here. Updated on 2019 Via Cascina Bellaria , Milan , ITALY (Postal Code: 20153). Swimmers like you reported 25 meters, Indoors. Phone number and email address are number for this Swimming Pool. Updated on 2019 Via A. Venegoni, 9 , 7th Zone , Milan , ITALY (Postal Code: 20153). Among all the activities supplied by the center, if you are interested in swimming you might appreciate 25 meters x 12.5 meters, 6 lanes, Indoors. Just in case you want to make contact with this Swimming Pool before dropping by, we only know the phone number. The information and facts of this Pool has been verified lately by a member of their staff.